In this article, we will discuss dependency injection. The term “Dependency Injection” has been coined by Martin Fowler. "Dependency injection is a software design pattern that implements inversion of control(IOC) contract for resolving dependencies. A dependency is an object(HAS-A/Composition) that can be used (a service). An injection is the passing of a dependency to a dependent object (a client/Top level) that would use it." The above Definition is bit abstract when you read about dependency injection for the first time. But, once you understand the logic, you don't want to memorize the definition to understand DI. Prior to taking an example Let clear a fundamental term. Foo is dependent Object and bar is a dependency. Say, A new Shop has been Opened which sells “Peter England” shirts. We will design it following way. return "PeterEngland [size=" + size + ", price=" + price + ", brand="
Here A Shop class has been created and this shop sells PeterEngland shirts. The shirt instance is created when shop class is instantiated. Although this implementation meets the desired output but it has some serious problem. As a developer, you should always avoid those. Problem 1: Shop class is strongly coupled with PeterEngland instance. They can’t be separated. So, if we want to test “isShopClosed” method, we need to populate PeterEngland instance. “isShopClosed” method talking about shop is closed or open, so PeterEngland shirt has no relation with this method. Still, we have to populate PeterEngland, which is unnecessary. Problem 2: This implementation does not welcome future changes say Shop now sells Other brands like Reebok, Addidas etc. To incorporate these changes, we need to refactor the whole Shop class. Now it will take brand name and based on brand name shirt instances will be created. So, Shop has a direct composition with each of the branded shirt. This design is very rigid and fragile by nature. It violates Open Closed principle also. Diagram :1 Shop depends on all kind of branded shirts. To solve this problem, we can apply IOC design pattern. IOC stands for Inversion of control. Inversion of control is a pattern used for decoupling components and layers in the system. The pattern is implemented through injecting dependencies into a component when it is constructed. These dependences are usually provided as interfaces for further decoupling. IOC says that we should design in such a way that the Top level component and lower level component both can depend on an interface. Here the magic starts as now both dependent class(Shop) and implementation class(Adidas,PeterEngland) both depends on an interface. Dependent object doesn’t know about actual implementation and actual implementation does not know who will use them. So it will be very flexible and welcome change. So, Now Shop (Top level component) don't a direct relation with PeterEngland or Adidas(implementation) and vice versa. But, they can talk each other through an interface. 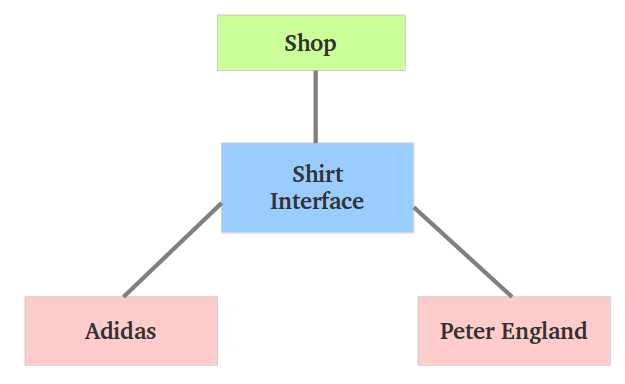 Diagram 2: Shop and (Adidas,PeterEngland ) depends on shirt interface. As Shop has a Shirt interface we can easily put a Mock/Dummy shirt then test it easily. This design welcome change with ease just needs to create a new class which implement Shirt interface. But, still Client has to inject the strategy to Shop component. It is the clients responsibility to provide actual strategy. Spring says Spring container will take care of the dependency, a developer does not have to bother about dependency and only concentrate on business logic. We call it Dependency Injection, (Spring container injects dependencies for you). It maintains the strategy in a XML file (Spring configuration xml), Spring container reads instruction from there and wiring Spring beans together. Many developers use IOC and DI term interchangeably but IOC is more abstract it does not tell which part has inversed but DI tells you Dependency control has been inversed. Constructor Injection: Through constructor parameter, Spring injects dependency bean. In case of Constructor injection, we use <constructor-arg ref="adidas"/>. Using this, Spring container pass Adidas bean to Shop constructor as ref property is point to Adidas bean‘s id. Same in Setter injection, we declare <property name="shirt" ref="peterEngland"/>. Using this Spring container invoke SetShirt() method (setter of the property) and injects PerterEngland bean. Please note that in case of Setter injection, always provide Setter method of the property unless Spring will throw an exception.